V.com weekend vote: Who is your musical role model? We human beings tend to be inspired by other human beings that we hold in high regard -- as long as we don't go down the wrong road and get jealous! Inspiration is something we need -- it keeps us in that practice room, holds us to a higher standard, makes us strive. Sometimes that's a superstar whose playing is an example of near-impossibly high standards -- Heifetz, Joshua Bell, Hilary Hahn come to mind. It can also be someone closer and more personal in our lives: a teacher, a fellow student or a colleague. When I was a child, my first "role model" was probably the late Eugene Fodor, who at the time was quite a superstar, having more or less won the Tchaikovsky Competition. I could not stop listening to his recordings, and I was mesmerized by his playing in real life. He was a native of Denver, where I grew up. I wanted to play the way he could play! But I've not always been inspired by superstars. When I was in college, I felt more inspired by my fellow students, and not simply because they played well. I remember one student, not even a violin student but a piano student, who had the most amazing practice ethic. Every day, several times, without fail. Such discipline! This was a person who knew how to say, "No, I have to practice." I wanted to be that kind of practicer. To have this role model, this steady example of someone with such iron discipline, was a great motivation to me at the time. I've also been inspired by teachers. When I was at Indiana University, even though my teacher was not Josef Gingold, I felt inspired by both his wisdom (which I saw at master classes) and his example as a generous human being who had a successful life in music. Sometimes teachers seem to know so much and have such a rich connection with the world of classical music (or other kinds of music) -- this can also fuel our fire. Out in the "real world" I have been inspired by colleagues, particularly the ones who continue to try new things. One colleague self-produced a beautiful recording -- over one weekend! Wow! Others have found such interesting ways to live their lives in music -- touring with pops groups, starting a chamber series, etc. Sometimes I can be inspired simply by someone who has kept up their chops -- the professor Stanley Ritchie, for example, plays all the Bach Sonatas and Partitas better than most humans ever will, and he's in his 80s! I'm also inspired when I go to international competitions and see young people who have worked so hard and who have brought their standards to such a high level at a young age. If you examine your sources of inspiration these days, who is the greatest role model for you at the moment? Please submit your vote and also tell us about who inspires you, and why! I voted A TEACHER. 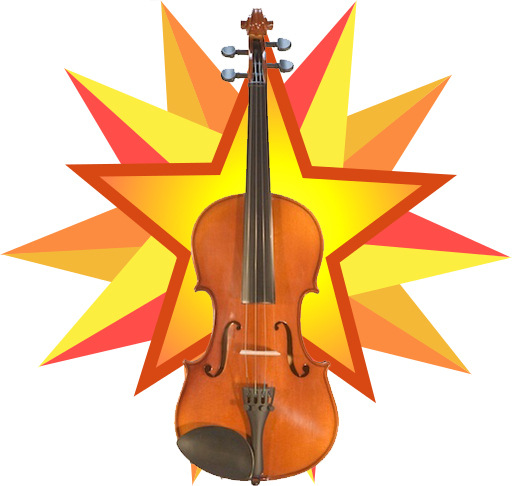 I had six teachers over a long stretch, but it was my first teacher's dark viola-type sound that has most stayed on my mind ever since I first heard it. And we know how impressionable kids are. I was a motivated practicer, much like the piano student mentioned above, and my teacher and I worked well together from the start. Among superstar role models, I name David Oistrakh, Isaac Stern, and Arthur Grumiaux -- or, more precisely, their vintage recordings. My family had a sizable record collection. As a 7-year-old kid, I would sit alone in the living room and listen for hours -- my idea. I'm impressed--a large majority have a role model. I put down "none" because there is no one who inspires me on an ongoing basis. But at least there are many who have the potential to inspire me if I were exposed to them more. Itzak Perlman, Janine Jansen, Anne-Sophie Mutter, and Midori come to mind. For me this is almost too difficult to call because of the mix of countless good influences I've had over a fairly long life from teachers of various instruments, fellow students, fellow players (including inspirational conductors), outstanding soloists both live and recorded, and even the proprietor of a violin store who put me in contact with my last teacher. However, pressed for a single choice I'd say "teacher", particularly my last one who taught me to play the violin. It's hard to choose just one answer here, because inspiration comes from so many sources. However, my current role model happens to be my stand partner at ensemble. She's a teacher, but she's not my teacher, so I chose colleague as my answer. If I can one day emulate her tone and ease of playing, along with her amazing sight reading capability, I will count myself truly lucky. This was hard to answer, but since I had to choose just one, I chose my violin teacher. Over the years she has become a colleague and friend as well as a teacher. While I admire her playing, and try to emulate it, what I think has influenced me more is her overall approach to music and philosophy of life. She has always fought for accessibility and said that music is for everyone. I also often keep in mind someone who I'll call a colleague, but who passed away a couple of years ago when she was 97, Phyllis Spence. She was the concertmistress of my orchestra for 50 years and I have the great honor of following in her footsteps. She was born in 1916, and came of age in an era when women of her social class generally did not go to conservatory, so she was largely self-taught after age 18. At her funeral I learned that she sat in on and audited conservatory classes for many years, and composed music. She was a force to be reckoned with in community and church music: she founded several music societies in the Boston area, she was a leader in her church, she held chamber music soirees in her home and played music with some of greatest scientific minds of her generation. Although she had retired as concertmistress before I met her, she still played in the first violin section of the orchestra until she was 95. It kept her young. I want to be her when I grow up. Well, I voted "superstar" only because there wasn't a category for "not quite a superstar" or "local/regional artist". Anyway, since I chose a superstar it is Itzhak Perlman. Not only is he one of, if not THE, greatest living violinists of our time, but he always seems to me to be completely and totally connected emotionally to every single note he plays. I never feel like he's just going through the motions or just playing through a piece because it's part of the standard repertoire. And he's a helluva Klezmer fiddler as well who can improvise. And he doesn't seem to be above learning from another musician even if they're not "at his level", so to speak. It's not just technique on the instrument for me. I'm inspired by their life story and the person they are because that determines how they connect with their music and through that, their listeners. It really does depend what for. For accompanying hymns, whether on violin/viola or keyboard, it's Beethoven/Schubert, because I am much more at ease improvising my own accompaniments than playing what's written in the music copy (though I wish I could play that more accurately when what's written is really, really good, e.g., JSB, Hugh Wilson - But even then, I feel a need to change the accompaniment from verse to verse to draw more attention to the words - Don't have me on a keyboard instrument if you're expecting me to lead or train a choir!!!). Beethoven was a teacher, but I don't think Schubert was, so I don't think I can vote - "Composer" wasn't one of the options. For musicianship when performing, at the moment it's Leonard Elschenbroich, because his improvised cadenza to the Haydn captivated my whole attention. No "fireworks", but a total masterpiece in musical expression, demanding a technical expertise at least as great as "fireworks" would demand. When I was in my first professional orchestra, my role model was the principal second violinist. He was such a pro orchestra player, just the way he could read anything, the way he counted every single beat, never missed an entrance, never mis-counted bars of rest. He'd do every marking on the page -- bowings, dynamics, articulations -- all from the beginning. I was impressed even the way he could mark the part, with just the right shorthand. So efficient, that professionalism made me want to be THAT kind of orchestra player.